There is an area of low pressure in Saskatchewan this morning, heading east. This will do a couple of things to the weather in North Dakota over the next 24 to 36 hours. First it will shift the wind to the south and try to bring in slightly warmer air into the region today. The problem is most of the state is covered with the low stratus deck that has plagued the area for most of the past few weeks. That “gloom” will keep the temperatures from climbing much today. Western North Dakota that saw some thinning of the clouds and colder morning temperatures. 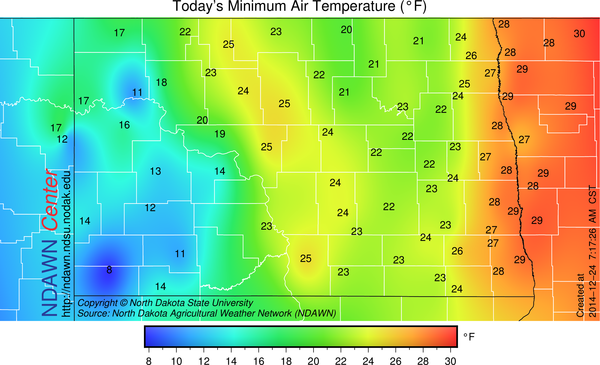 Western North Dakota that saw some thinning of the clouds and colder morning temperatures will see a significant warm up today into at least the upper 20s if not into the low to mid 30s. But eastern North Dakota and western Minnesota that is starting the day off with temperatures near 30° will likely see only a minimal temperature raise during the day. Another influence that area of low pressure will have on the region will be the threat of some very light snow. There may be a dusting of snow in some locations, with the highest probability of such an event occurring being near the US / Canadian border. The third influence on that low pressure system will have is cooling down the area as a cold front is associated with this low pressure center. Once that cold front moves through later today, then most of the next week will record below average temperatures for the rest of 2014. Christmas Day will be the transition day and still not be all that cold, but thereafter, near or below average temperatures are expected. With the colder air will come little if any precipitation, but on Christmas night into early Friday morning locations near and south of the North Dakota / South Dakota border and southward may get a light (generally 1″) accumulating snow, but that looks to be missing most of North Dakota.